Scarves and Gloves always go together along with a Beanie. This is especially true if you are looking for a set to combat the cold climate weather. Instead of buying these accessories individually, you can save time and trouble by buying them online. In cooler seasons, people are in dire need of clothing that will keep them warm and shielded from the often-unrelenting cold weather. Scarf and Glove Sets is a necessary pair that will do the job. As a set, these scarves and gloves have fun, coordinating designs that can match your Beanie Hats. The need to hunt for individual items is a task that can be cut short as a set is able to eliminate this. Young children benefit from these matching sets as they will not forget the gloves that go hand-in-hand with the scarf they are wearing, or the scarf that matches their gloves. The Scarf and Glove Sets work to keep warm the neck and hands of a person: this is important as these areas of the body tend to be very susceptible to the cold. Shivers and chills will not be an issue with Scarf and Glove Sets, essential items for the colder weather for any person. Scarves and Gloves always go together and they go together with beanies of any style. 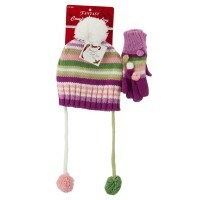 Here at e4Hats.com, we have a wide selection of Scarf and Glove Sets that you can choose from. Wear them at any occasion that calls for these accessories. Find Scarf and Glove Set that are versatile so that you can wear them with your Designed Short Beanies. But if you cannot find a specific design or set of scarf and gloves that you matches your Cuffed Beanies, you can still go for Bucket Hats. You can never go wrong with bucket hats as they are very versatile and they fit just about any types of occasion. You are not only limited to wearing them on summer but even on winter as well if you don’t have other hats lying around in your wardrobe. Another hat that you can wear to protect your head from the cold is a Trapper Hat. Trapper Hats are made from thick materials that are great when it comes to insulating your head. They also come with ear flaps so your ears do not get frozen from sticking out of the hat for a long time.